Earlier today, members of the Formentera Council —President Jaume Ferrer and councillor of education Susana Labrador— had the opportunity to meet with several visiting representatives of the Govern Balear. From the autonomous government in Palma, education and universities councillor Martí March, education delegate in Eivissa and Formentera Margalida Ferrer, director general of planning and administrations Antonio Morante and director general of innovation and educational communities Jaume Ribas Seguí were all present for gatherings with the local administration. At the encounter, President Ferrer articulated the requests of the local educational community. “The priority is building a new school in Sant Ferran. We have pushed for this for years and are anxious see it happen. The sooner the better,” Ferrer explained after the meeting. Moreover, the Consell Insular de Formentera (CiF) administration appealed to Councillor March to make an effort in the coming year “to bolster the number of technical programmes available. These are programmes that have suffered cutbacks four years running”. Ferrer voiced his appreciation for the education councillor's visit and the amenable nature of the talks, which he noted were a far cry from those of the previous legislative sitting, “when not one of the three education office councillors in Palma made an official visit to Formentera”. 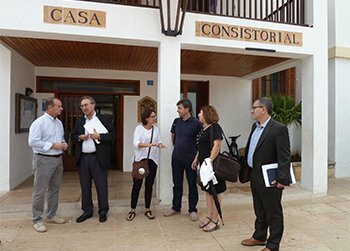 For his part, the Govern Balear's education councillor said the visit was necessary in order to start “formulating an idea about the real needs present here on Formentera”. Following such analysis, he said, the goal will be “to create a road map —for both the medium and long term— to meet those needs”. March indicated the smooth communication enjoyed by the Palma and Formentera administrations “will be key for our work together in the future”. Councillor March assured that the 2016 budget would include funding for construction of the new Sant Ferran school, stating, “[this is] a plan we want to make sure moves forward. We will do whatever it takes to ensure it happens as soon as possible”. March also expressed his sympathy for the push to increase the number of technical courses of study available on the island — and to add an arts module to the batxillerat programme of Formentera's secondary school. Having completed the day's talks with Formentera Council officials, March went on to meet with representatives of the educational community on the island. Representing the Formentera Council, social welfare councillor Vanessa Parellada and culture, education and patrimony councillor Susana Labrador, together with Marilina Bonet, social educator at the local office of education, delivered diplomas to graduates of the social and educational programmes ALTER and PISE for students enrolled at IES Marc Ferrer and aged 14 to 16. Of the six students present at the start of the academic year, five successfully completed their coursework. 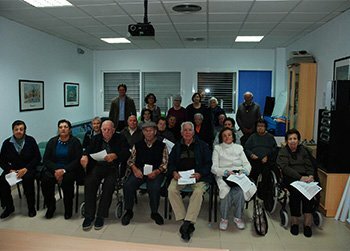 Three were enrolled in the social and educational action programme, PISE, a joint project of the Balearic Regional Ministry of Education and the Formentera Council. 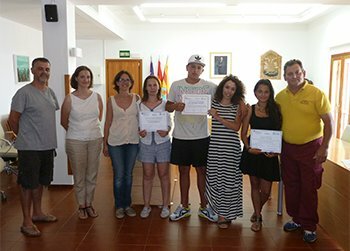 The other three students pursued studies through ALTER, a programme of the Regional Ministry of Family and Social Services that also benefits from the collaboration of the Formentera administration. The objective is to cater to the educational needs of secondary students with difficulties adapting to the traditional school environment. According to Susana Labrador, “successfully combatting dropout and motivational problems among students enrolled in much-needed training” is also a question of “seeking out more appealing learning techniques”. For her part, Parellada stressed before the youth present “the importance of studying now in order to assure better employment conditions in the future”. Both ALTER and PISE push growth in three different areas. On the one hand, students are required to attend an educational centre in person in order to complete a basic set of subjects. On the other, they learn a vocation of their choosing, through placement at a local business. Lastly, the students work with an educator on a host of different subjects, including their own professional development and even healthy living habits. The businesses that participated in the two alternative education programmes are Sonia hairstylists, the SEAT garage, Nàutica Pins, the Europa garage and the early-education nursery, Escoleta Sa Miranda. 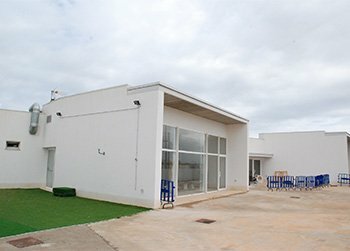 The education office of the Formentera Council has published the provisional lists of admitted students at the island's two public nurseries (escoletes), Sa Miranda in Sant Francesc and the soon-to-be-opened addition along the old road to la Mola (a thoroughfare referred to commonly as 'el Camí Vell'). The Camí Vell escoleta will open its doors on 1 June as a summer school for children ages one through three. Allocating spots for all 23 of the applications received, Council offices happily announced that the centre would meet 100% of this year's demand. As for Sa Miranda, the centre was able to accept 62 of the 80 children who applied, or 77.5%. Of those 62 infants, 54 will go to Sa Miranda (67.5%) while the remaining eight —who placed the Camí Vell site as a second option— will attend the newer of the two escoletes. The 18 children who were not given a placement have been put on a wait list. The placements have been published on the Sa Miranda school and the Formentera Council website and there will be a three-day period (ending 22 May) during which time families can review, comment on or contest the placements. Nearly complete is the transformation of the former Casal de l'Esport (sport centre) into the island's second nursery. This week, after new toilets are fitted and separation walls are installed to divide the space into three different classrooms, the centre will be painted. Next week, the school will be equipped with tables, chairs and other furnishings. The Formentera Council has already finished the hiring process for two of the three staff members required at the new site. Duties of the third staff member will be assumed by an employee of Sa Miranda. 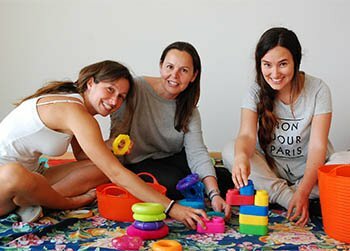 This morning, tucked between the Casal de l'Esport of the municipal football pitch and the Camí Vell de la Mola, the new summer nursery opened its doors to the public. The first day was intended as an opportunity for one to three year old students and their families to discover the newly-fitted space and get to know their future educators. The experience was positive for everyone involved. An adaptation period at the centre will begin tomorrow, during which time children attend the escoleta accompanied by a family member in order to progressively adapt to a 9 a.m.-to-2 p.m. time table. The nursery is an extremely luminous space that comprises three classrooms, a kitchen, a cafeteria, toilets adapted for infants and a small room for nap-time. Council workers put finishing touches on the centre yesterday, focusing on the installation of artificial turf and increasing available shaded areas. The Universitat per a Majors project, backed by the Universitat de les Illes Balears, the Govern Balear, the Formentera Council and l'Obra Social de la Caixa, is returning to Formentera. This Friday, 8 May, at five p.m. in the Sant Ferran social centre, a conference entitled “Cants de tradició oral a Eivissa i Formentera” ('Orally-transmitted traditional song in Eivissa and Formentera'), imparted by Dr Jaume Escandell, will kick off the lecture series. One of the paramount ideas behind the conference series – which will make stops in Sant Francesc, Sant Ferran and La Mola – is that learning never stops. The 5-6:30 p.m. slot will remain unchanged throughout the series, whose next appearance will come to pass 22 May at the La Mola senior centre with a conference by Dr Olga Cardona, “El que s'ha de saber de les herències” ('Understanding inheritance'). The following week, 29 May, Dr Jaume Vadell will speak in Sant Francesc on “Agricultura Ecològica”. In June, Josep L. Joan will host a talk in Sant Ferran on “Les tradicions rurals d'ahir: llavors de futur per al camp d'Eivissa i Formentera” ('Bygone rural traditions: seeds of the future for the Eivissa-Formentera countryside') [19 June], the last conference before breaking for the summer heat. The series will start up again in September, when children head back to the classroom too. 18 September, in Sant Francesc, José M. Escalona will lead a lecture titled “El vi saludable” ('Healthy wine'). Two different talks are on the agenda in October: on the 2nd in Sant Ferran, “Els topònims de Formentera al llarg de la història de la cartografia” ('Formentera toponyms throughout the history of cartography') , led by Josep A. Prats. And then, having kicked things off in May, on 23 October Dr Jaume Escandell will be back in Sant Francesc to lead the final talk, “Músiques instrumentals de transmissió oral a les Pitiüses” ('Orally-transmitted instrumental music in the Pitiüsa islands'). All of the conferences are open to the public.